Catch-and-release electrospray ionization mass spectrometry (CaR-ESI-MS), implemented using model membranes (MMs), is a promising approach for the discovery of glycolipid ligands of glycan-binding proteins (GBPs). Picodiscs (PDs), which are lipid-transporting complexes composed of the human sphingolipid activator protein saposin A and phospholipids, have proven to be useful MMs for such studies. The present work compares the use of conventional (pre-loaded) PDs with passively loaded PDs (PLPDs) for CaR-ESI-MS screening of glycolipids against cholera toxin B subunit homopentamer (CTB5). The pre-loaded PDs were prepared from a mixture of purified glycolipid and phospholipid or a mixture of lipids extracted from tissue, while the PLPDs were prepared by incubating PDs containing only phospholipid with glycolipid-containing lipid mixtures in aqueous solution. Time-dependent changes in the composition of the PLPDs produced by incubation with glycomicelles of the ganglioside GM1 were monitored using collision-induced dissociation of the gaseous PD ions and from the extent of ganglioside binding to CTB5 measured by ESI-MS. GM1 incorporation into PDs was evident within a few hours of incubation. At incubation times ≥ 10 days, GM1 binding to CTB5 was indistinguishable from that observed with pre-loaded PDs produced directly from GM1 at the same concentration. Comparison of ganglioside binding to CTB5 measured for pre-loaded PDs and PLPDs prepared from glycolipids extracted from pig and mouse brain revealed that the PLPDs allow for the detection of a greater number of ganglioside ligands. Together, the results of this study suggest PLPDs may have advantages over conventionally prepared PDs for screening glycolipids against GBPs using CaR-ESI-MS. The online version of this article ( https://doi.org/10.1007/s13361-018-1936-8) contains supplementary material, which is available to authorized users. Many important cellular processes, such as recognition, signaling, development, and differentiation, as well as bacterial and viral infections, rely on non-covalent interactions between glycan-binding proteins (GBPs) and glycolipid ligands [1, 2]. Most glycolipids found in animals are glycosphingolipids, wherein the carbohydrate (mono- or oligosaccharide) is attached to a ceramide lipid moiety . The ceramide imbeds in the cell membrane, leaving the carbohydrate exposed to aqueous solution and available for binding to GBPs. Although the carbohydrate moiety is primarily responsible for recognition, it is known that the membrane can influence GBP interactions with glycolipids [3, 4]. For example, the bilayer serves to orient the glycolipids and enables them to cluster, which can lead to a strengthening (due to avidity) or weakening (due to steric effects) of the GBP interactions [5, 6]. The presence of other membrane components, such as cholesterol, may also affect the strength of GBP binding . Glycolipid interactions with water-soluble GBPs can be studied under native-like conditions using model membranes (MMs), such as supported lipid bilayers, liposomes, nanodiscs (NDs), which are discoidal phospholipid bilayers surrounded by two copies of a membrane scaffold protein (MSP), and picodiscs (PDs) which are lipid-transporting macromolecular complexes composed of human sphingolipid activator protein saposin A (SapA) and lipids [5, 8, 9, 10, 11, 12]. The GBP interactions with glycolipids can be detected by a variety of methods, including fluorescence, surface plasmon resonance and nuclear magnetic resonance spectroscopy, quartz crystal microbalance, or flow cytometry [5, 6, 13, 14, 15]. Recently, catch-and-release electrospray ionization mass spectrometry (CaR-ESI-MS) has emerged as a promising method for screening glycolipids against GBPs [10, 12, 16, 17]. Briefly, the assay involves incubating GBPs with glycolipid-containing NDs or PDs, in aqueous solution. The GBP interactions with glycolipids (imbedded in the MM) are then detected by transferring the intact GBP–glycolipid–MM complexes to the gas phase using ESI. After desolvation, the GBP–glycolipid complexes spontaneously release from the MM ions and can be detected by MS. To facilitate the identification of the glycolipid ligands, the GBP–glycolipid complexes are collisionally activated in order to release the glycolipid (as ions), which are subsequently analyzed by ion mobility separation (IMS), collision-induced dissociation (CID), and MS . While both NDs and PDs have been used to detect moderate-to-high affinity GBP–glycolipid interactions by CaR-ESI-MS, PDs have been shown to be superior for detecting low affinity (≤ 103 M−1) interactions [16, 17]. One of the outstanding challenges to using NDs and PDs as glycolipid arrays for screening, particularly when produced from glycolipid/lipid mixtures extracted from cell culture or tissue, is the non-uniform incorporation efficiencies of the various glycolipids present in the mixture. For example, PDs are typically formed by incubating SapA with liposomes, formed from glycolipid/phospholipid mixtures, followed by purification using size exclusion chromatography [12, 17]. If the glycolipids present in the mixture have different incorporation efficiencies, the composition of the “pre-loaded” PDs will not quantitatively reflect the original composition of the mixture and, in the cases of low incorporation efficiencies, this could result in false-negative binding results. It is known that phospholipids can spontaneously transfer between organized lipid membrane assemblies (e.g., micelles or lipid bilayers), on timescales ranging from hours (h) to days [18, 19, 20]. Lipid exchange is thought to occur either through a lipid monomer diffusion model, whereby lipid monomers partition between the lipid assemblies and aqueous solution and, through diffusion, are taken up by other lipid assemblies, or a collision model, whereby a collision complex forms between different lipid assemblies and allowing for lipid diffusion within the complex [19, 20, 21]. Moreover, it has been shown that lipids and glycolipids are rapidly exchanged, on the timescale of minutes (min), between NDs and PDs and that SapA can efficiently transfer glycolipids from liposomes to proteins [22, 23, 24]. Therefore, it may be possible to mitigate, at least to some extent, the deleterious effects of non-uniform glycolipid incorporation efficiencies using spontaneous glycolipid transfer from micelles to pre-formed, phospholipid PDs to alter their composition and enhance their utility for glycolipid screening. Here, we compare the use of conventional, pre-loaded PDs, prepared from a mixture of purified glycolipid and phospholipid or lipids extracted from tissue, with passively loaded PDs (PLPDs), prepared by incubating phospholipid PDs with glycolipids (in the form of glycolipid micelles ) in aqueous solution, for CaR-ESI-MS screening of glycolipids against cholera toxin B subunit homopentamer (CTB5). The results were compared with CTB5 binding data acquired for pre-loaded PDs, prepared directly from the glycolipid/lipid mixtures to assess the performance of the PLPDs for glycolipid screening. A small number of comparative measurements were also performed on pre-loaded and passively loaded NDs. Cholera toxin B subunit homopentamer from Vibrio cholerae (CTB5, homopentamer molecular weight (MW) 58,020 Da) was purchased from Sigma-Aldrich Canada (Oakville, Canada). Saposin A (SapA, the two major isoforms have MWs of 8918 and 9049 Da) and recombinant MSP (MSP1E1, MW 27,494 Da) were expressed and purified as previously described [9, 11]. The ganglioside GM1 (β-D-Gal-(1→3)-β-D-GalNAc-(1→4)-[α-D-Neu5Ac-(2→3)]-β-D-Gal-(1→4)-D-Glc-ceramide; the major isoforms present, d18:1–18:0 and d20:1–18:0, have MWs of 1545.8 and 1573.9 Da, respectively), GM2 (β-D-GalNAc-(1→4)-[α-D-Neu5Ac-(2→3)]-β-D-Gal-(1→4)-D-Glc-ceramide; the major isoforms present, d18:1–18:0 and d20:1–18:0, have MWs of 1383.7 and 1411.7 Da, respectively) and GM3 (α-D-Neu5Ac-(2→3)-β-D-Gal-(1→4)-D-Glc-ceramide; the major isoforms present, d18:1–18:0 and d20:1–18:0, have MWs 1180.5 and 1208.5 Da, respectively) were purchased from Cedarlane Labs (Burlington, Canada). GD1a (α-D-Neu5Ac-(2→3)-β-D-Gal-(1→3)-β-D-GalNAc-(1→4)-[α-D-Neu5Ac-(2→3)]-β-D-Gal-(1→4)-D-Glc-ceramide; the major isoforms present, d18:1–18:0 and d20:1–18:0, have MWs 1836.1 and 1864.1 Da, respectively), GD1b (β-D-Gal-(1→3)-β-D-GalNAc-(1→4)-[α-D-Neu5Ac-(2→8)-α-D-Neu5Ac-(2→3)]-β-D-Gal-(1→4)-D-Glc-ceramide; the major isoforms present, d18:1–18:0 and d20:1–18:0, have MWs 1836.1 and 1864.1 Da, respectively), GT1b (α-Neu5Ac-(2→3)-β-D-Galp-(1→3)-β-D-GalNAc-(1→4)-[α-Neu5Ac-(2→8)-α-Neu5Ac-(2→3)]-β-D-Galp-(1→4)-D-Glc-ceramide; the major isoforms present, d18:1–18:0 and d20:1–18:0, have MWs 2126.4 and 2154.4 Da, respectively) were purchased from Sigma-Aldrich Canada (Oakville, Canada). GD2 (β-D-GalNAc-(1→4)-[α-D-Neu5Ac-(2→8)-α-D-Neu5Ac-(2→3)]-β-D-Gal-(1→4)-D-Glc-ceramide; the major isoforms present, d18:1–18:0 and d20:1–18:0, have MWs 1674.0 and 1702.0 Da, respectively) was purchased from MyBioSource Inc. (San Diego, CA). The phospholipid 1,2-dimyristoyl-sn-glycero-3-phosphocholine (DMPC, MW 677.9 Da), 1-palmitoyl-2-oleoyl-sn-glycero-3-phosphocholine (POPC, MW 760.08 Da), and pig brain glycolipid extract were purchased from Avanti Polar Lipids Inc. (Alabaster, AL). Stock solutions (~ 1 mM in Milli-Q water (Millipore, MA)) of the gangliosides and glycolipid extracts were stored at − 20 °C until needed. The structures of the phospholipids and the gangliosides used in this are shown in Figure S1, Supporting Information. Mouse brain (US origin CD-1) was purchased from Cedarlane Laboratories (Burlington, Canada) and stored at − 80 °C until used. The procedure for extracting the glycolipids was described previously . Briefly, the whole brain was weighed, thawed on ice, and added to 4 volumes of ice-cold water and homogenized. Methanol was added to give a methanol/water volume ratio of 8:3 and the mixture vortexed and brought to room temperature. Chloroform was added to give a chloroform/methanol/water volume ratio of 4:8:3. The suspension was further mixed and centrifuged at room temperature for 15 min. The supernatant was transferred, measured, mixed with 0.173 volumes of water, and separated by centrifugation again. The supernatant was collected and loaded onto a pre-washed tC18 Sep-Pak. The glycolipids were eluted with methanol, which was then evaporated under a stream of nitrogen; the glycolipids were then re-dissolved in methanol. Ganglioside (or glycolipid/lipid mixture), dissolved in 1:1 volume ratio of methanol/chloroform, was dried using nitrogen and kept in a vacuum desiccator overnight at room temperature to form a lipid film. The film was then re-dissolved in 200 mM aqueous ammonium acetate (pH 6.8, 25 °C), vortexed for 5 min and sonicated for 30 min [25, 27]. The micellar solution was stored at room temperature until used. Picodiscs composed of POPC (POPC-PDs), DMPC (DMPC-PDs), POPC and GM1 (GM1-containing POPC-PDs), POPC and library of seven gangliosides (≡7G library—GM1, GM2, GM3, GD1a, GD1b, GD2, and GT1b) and POPC with glycolipid extracts from pig or mouse brain were prepared using a protocol described by Popovic and co-workers , and only a brief overview is given here. Phospholipid (dissolved in chloroform), alone or as 4:1 M ratio mixture of phospholipid and purified glycolipids or lipid extract, was dried under a stream nitrogen to form a lipid film. The lipid film was kept in a vacuum desiccator overnight at room temperature. The film was re-dissolved in a 50-mM sodium acetate and 150-mM NaCl (pH 4.8) aqueous solution by sonication, followed by 10 freeze/thaw cycles to produce liposomes. To form PDs, SapA protein was added at 1:10 M ratio of SapA-to-total lipid, and incubated at 37 °C for 1 h. The PDs were then purified using a Superdex 75 10/300 size exclusion column (GE Healthcare Bio-Science, Uppsala, Sweden), equilibrated in a 50-mM sodium acetate and 150-mM NaCl (pH 4.8) aqueous solution. The PD fractions were concentrated and buffer exchanged into 200 mM ammonium acetate (pH 6.8). The PD concentration was determined from the concentration of SapA, which was measured based on UV absorbance at 280 nm and an extinction coefficient of 8855 M−1 cm−1, and assuming that the PDs contain predominantly (at time of preparation) four copies of SapA . For the GM1-containing PDs, the GM1 content was measured using ESI-MS and a stable isotope-labeled internal standard approach described elsewhere . The PDs were concentrated to 40 μM and stored at room temperature until needed. Nanodiscs composed of POPC (POPC-NDs), DMPC (DMPC-NDs), or POPC and GM1 (GM1-containing POPC-NDs) were prepared following a protocol described by Bayburt and co-workers [9, 30]. Briefly, phospholipid (dissolved in chloroform), alone or as 95:5 M ratio mixture of phospholipid and GM1, was dried under nitrogen and kept in a vacuum desiccator overnight at room temperature to form a lipid film. The film was then re-suspended in a 20-mM Tris HCl, 0.5-mM EDTA, 100-mM NaCl, 25-mM sodium cholate (pH 7.4) aqueous solution by sonication for 15 min. To form the NDs, MSP1E1 was added at 1:100 M ratio of MSP1E1-to-total lipid followed by incubation at room temperature for 15 min. ND formation was initiated by adding an equal volume of Bio-Beads (Bio-Rad Laboratories Ltd., Mississauga, Canada) and the solution was incubated at room temperature for 3 h to remove all detergent. Finally, the NDs were purified using a Superdex 200 10/300 size exclusion column (GE Healthcare Bio-Sciences, Uppsala, Sweden), which was equilibrated in a 200-mM aqueous ammonium acetate (pH 6.8) solution. The concentration of NDs was determined from the concentration of MSP1E1 dimer. For the GM1-containing NDs, the GM1 content was determined using ESI-MS and a stable isotope labeled internal standard . The NDs were concentrated to 60 μM and stored at − 80 °C until needed. The ESI-MS and CaR-ESI-MS measurements were carried out using a Synapt G2S quadrupole-ion mobility separation-time-of-flight (Q-IMS-TOF) mass spectrometer (Waters, Manchester, UK) equipped with a nanoESI source. The direct ESI-MS assay was implemented in positive ion mode, whereas the CaR-ESI-MS assay was performed in negative ion mode. A platinum wire was inserted into the nanoESI tip, produced from borosilicate capillary (1.0 mm o.d., 0.68 mm i.d.) using a P-1000 micropipette puller (Sutter Instruments, Novato, CA), and a voltage of 1.0 kV (positive ion mode) or − 0.9 kV (negative ion mode) was applied to carry out ESI. The source temperature was set to 60 °C. A cone voltage of 30 V was used. Trap and Transfer voltages of 5 and 2 V, respectively, for ESI-MS analysis. All data were processed using the MassLynx software (version 4.1) and Driftscope v.2.5 (Waters, Manchester, UK). Where indicated, background subtraction was performed using the Background Subtract function in MassLynx. where q is the number of L bound. For the CaR-ESI-MS measurements, the quadrupole mass filter was set (LM 4 and HM 15, window width ~ 100 m/z units) to pass a range of ions corresponding to the complexes of interest. Collision-induced dissociation was performed in the Trap region at voltages of 50 to 100 V. The released glycolipid anions were identified based on their measured MWs and, in some cases, by performing CID in the Trap region. When the free and glycolipid-bound CTB5 ions overlapped significantly (in m/z) with those corresponding to the PDs, IMS was used to separate the CTB5 ions from the PD ions. When IMS was employed, the release of glycolipid ions from CTB5 was carried out in the Transfer region. For the IMS measurements, a wave height of 40 V and a wave velocity of 650 m s−1 were used and the helium and nitrogen gas flow rates were 50 and 60 mL min−1, respectively. As a starting point for the present study, the binding of CTB5 with the high affinity ganglioside ligand GM1 in aqueous solution (in the form of glycomicelles ) or introduced into PDs and NDs was investigated. Shown in Figure 1a is a representative ESI mass spectrum acquired in positive mode for an aqueous ammonium acetate solution (200 mM, pH 6.8, 25 °C) of CTB5 (6 μM) and GM1 (40 μM). Notably, only free CTB5 ions, i.e., CTB5n+ at n = 14–16, were detected under these conditions; this is in striking contrast to the, essentially, complete occupancy of CTB5 binding sites expected for GM1os when present in solution at the same concentration . The absence of any detectable GM1-bound CTB5 ions produced directly from the solution of GM1 micelle is consistent with the findings of a recent study, which showed that the detection of CTB5–GM1 interactions by ESI-MS using glycomicelles requires higher GM1 concentrations . Representative mass spectra measured for aqueous ammonium acetate solutions (200 mM, pH 6.8, 25 °C) of CTB5 (6 μM) with GM1-containing POPC-PDs and GM1-containing POPC-NDs are shown in Figure 1b, c, respectively. The total GM1 concentration was 40 μM in both cases and the average number of GM1 per PD was 8.32 ± 0.48 and 5.70 ± 0.20 per ND. When CTB5 was incubated with the PDs, signal corresponding predominantly to CTB5 bound to three to five GM1 was detected, i.e., (CTB5 + qGM1)n+ with q = 3–5 and n = 15–17 (Figure 1b). The significant background observed from m/z 3500 to m/z 4500 is attributed to PD ions containing variable numbers of SapA and phospholipid, over a range of charge states . As described elsewhere, it is possible to separate the (CTB5 + qGM1)n+ ions from the PD ions, based on differences in their IMS arrival times [12, 17]. However, the distributions of (CTB5 + qGM1) species determined from the mass spectra acquired using IMS filtering (to remove the contribution of PD ions) are similar to those obtained by simply performing background subtraction. For example, the relative abundances of the (CTB5 + qGM1) species, with q = 3, 4, and 5, determined from the mass spectrum shown in Figure 1b after background subtraction are 0.03, 0.35, and 0.62, respectively, and 0.04, 0.38, and 0.58, respectively, after IMS filtering (Figure 1b, insets). Because IMS filtering provided no significant advantage over background subtraction, only the latter approach was used for the determination of the relative abundances of the (CTB5 + qGM1) species from solutions containing PDs. The ESI-MS results obtained for the solution of CTB5 incubated with NDs are qualitatively similar to those obtained for the solution containing PDs—ions corresponding to CTB5 bound to between three and five GM1 were observed (Figure 1c). In this case, there was no overlap between the (CTB5 + qGM1)n+ and ND ions and, consequently, no IMS filtering or background subtraction was needed. The normalized distributions of (CTB5 + qGM1) species determined from the mass spectra described above, and the distribution expected for GM1os under the same conditions, are shown in Figure 1d. From this plot, it can be seen that, when GM1 is present in PDs, the binding site occupancy is slightly higher than observed with NDs, but does not reach the near-complete occupancy achieved with GM1os . For ease of comparison, these distributions can be converted into the fraction (f) of CTB5 binding sites that are occupied. For GM1os, f is ~ 1.0; for GM1 in aqueous solution, is f ~ 0 (i.e., no detectable complexes). For GM1-containing PDs and NDs, f is 0.90 and 0.87, respectively. To test the feasibility of preparing GM1-containing PDs from phospholipid PDs and GM1 glycomicelles, POPC-PDs (12.5 μM) were incubated in aqueous ammonium acetate solutions (200 mM, pH 6.8, 25 °C) of GM1 (50 μM) at room temperature for 5 min, 4 h, 2.5 days, 7 days, 10 days, 14 days, 17 days, and 20 days. Following incubation, an aliquot of solution was removed and the PDs analyzed for GM1 content (Figure S2, Supporting Information). The solution was then mixed with CTB5 (final concentrations: 6 μM CTB5, 10 μM POPC-PD, and 40 μM GM1) and the extent of GM1 binding measured (Figure 2). To monitor GM1 incorporation into the POPC-PDs (as a function of incubation time), CID was performed in negative ion mode on ions with m/z values of 6100 (± 100). As controls, measurements were also performed, using identical conditions, on ions produced from solutions containing only GM1 or POPC-PDs. As can be seen from the ESI mass spectra shown in Figure S2 (Supporting Information), the m/z of the GM1 micelle ions (approximately m/z 8000 to m/z 12,000) are larger than those of the PDs (approximately m/z 4500 to m/z 7000). In the absence of POPC-PDs, CID of ions at m/z 6100 (± 100) produced no GM1 ions (Figure S2a, k, Supporting Information), while in the absence of GM1, CID of the POPC-PD ions produced only free and POPC-bound SapA ions (Figure S2b and l, Supporting Information). Following 5 min incubation of the PDs with the GM1 glycomicelles, GM1 ions were detected in the CID mass spectra (Figure S2c, m, Supporting Information). With increasing incubation time, the abundance of the GM1 ions, relative to free and POPC-bound SapA ions, increased and, at incubation times of ≥ 10 days, they were the most abundant ions in the CID mass spectra (Figure S2d–j and n–t, Supporting Information). Taken together, these results suggest that incubation of POPC-PDs with GM1 glycomicelles results in the spontaneous transfer of GM1 to the PDs and that the amount of GM1 incorporated increases with incubation time (up to ~ 10 days). Analysis of the solution of CTB5 and the 5 min PLPD revealed abundant free CTB5 ions, as well as a minor amount of CTB5 bound to one GM1 (Figure 2a). This result contrasts with the absence of detectable CTB5–GM1 complexes for the solution containing only CTB5 and GM1 glycomicelle (Figure 1a). With increasing incubation time, the extent of GM1 binding to CTB5 increased, reaching a maximum at 10 days (Figures 2b–d and 3). At incubation times of ≥ 10 days, ions corresponding to CTB5 bound to four and five GM1 dominated the mass spectra (Figures 2e and S3a–c, Supporting Information). These results are consistent with GM1 being incorporated into the POPC-PD and becoming available for binding to CTB5. Analogous measurements carried out using PDs prepared from DMPC produced results that closely match those obtained for the POPC-PDs (Figures 2f–j and S3d–f, Supporting Information). This finding suggests that the GM1 transfer process (from glycomicelle to PD) is relatively insensitive to differences in the structures of the two phosphatidylcholines used to prepare the PDs. Plotted in Figure 3a are the time-dependent f calculated from the mass spectra shown in Figures 2 and S3 (Supporting Information). Also shown are f values measured for solutions of CTB5 (6 μM) and PLPDs prepared using different initial concentrations of POPC-PD (10 or 20 μM) and GM1 (40 or 50 μM). Notably, the time-dependent f data obtained from the four PLPD solutions are indistinguishable, within experimental error. For incubation times between 5 min and 10 days, f increases essentially linearly with time (Figure S4a, Supporting Information). At > 10 days, a limiting value of f is reached (from 0.82 to 0.87 for the POPC-PDs and 0.82 for the DMPC-PDs). Given the fast kinetics of CTB5 (which is added to the solution immediately before the ESI-MS measurements are performed) binding with GM1 in the PDs [12, 17], it can be reasonably suggested that the time-dependence of f reflects the rate at which GM1 is transferred from glycomicelles to the PDs. Moreover, given that the time-dependent f plots are linear (at incubation times of 5 min to 10 days) and independent of the initial concentrations of GM1 and PDs used to produce the PLPDs, it can be further suggested that the rate limiting step for the formation of the passively loaded GM1 PDs is a zero-order process, with apparent rate constants of (3.4 ± 0.1) × 10−3 f h−1 (Figure S4a, Supporting Information). To establish whether the nature of the lipoprotein disc influences the extent and rate of GM1 incorporation, analogous measurements were performed on NDs, prepared from POPC or DMPC. Representative mass spectra are shown in Figure S5 (Supporting Information) and the corresponding f values are shown in Figure 3. Qualitatively, the results obtained for the NDs are similar to those reported above for the PDs—the extent of binding site occupancy increases linearly with incubation time. However, as can be seen from Figure 3b, at all incubation times investigated, the f values are smaller than those measured for the PDs. For example, at 10 days, the f values for the NDs are 0.32 (POPC) and 0.27 (DMPC) and 0.86 (POPC) and 0.81 (DMPC) for the PDs. These results suggest that the net rate of GM1 transfer to NDs is approximately one-third of that for PDs, with apparent zero-order rate constants of (1.3 ± 0.1) × 10−3 f h−1 (POPC-NDs) and (1.2 ± 0.1) × 10−3 f h−1 (DMPC-NDs) (Figure S4b, Supporting Information). Taken together, these results demonstrate that it is possible to incorporate GM1 into phospholipid-containing PDs and NDs through incubation with GM1 glycomicelles in aqueous solution. Moreover, comparative binding measurements performed with CTB5 revealed that, given sufficiently long incubation times (for the preparation of PLPDs), it is possible to achieve the same extent of GM1-CTB5 binding (as measured by ESI-MS) with PLPDs as with pre-formed PDs (produced using the same GM1 concentration). The GM1 incorporation process (into the MMs), inferred from the rate of change of CTB5 binding site occupancy, appears to be relatively slow and is somewhat sensitive to the nature of the lipid discs but independent of structural differences in the structures of the two phosphatidylcholines used to prepare the PDs. The reasons for the apparent zero-order transfer kinetics, as well as the slower incorporation rates measured for NDs compared to PDs, are not fully understood and require further investigation. Because the CTB5–GM1 interactions are high affinity , it was of interest to test whether similar results are obtained with lower affinity glycolipid ligands. With this in mind, the binding of CTB5 with PLPDs produced by incubating POPC-PDs with an equimolar library of seven purified gangliosides (7G library) in aqueous solution was analyzed by CaR-ESI-MS and the results compared to those obtained using PDs directly prepared from the library . As reported previously, the oligosaccharides of GM2, GM3, GD1a, GD1b, and GT1b bind to CTB5 with low affinity (~ 500 M−1) . The GD2 pentasaccharide does not bind and, therefore, GD2 served as a negative control [17,32]. Shown in Figure 4 are representative post-IMS mass spectra acquired in negative ion mode for aqueous ammonium acetate solutions (200 mM, pH 6.8, 25 °C) of CTB5 (6 μM) and PLPDs (10 μM) produced through incubation (4 h, 2.5 days, 5 days, or 10 days) with the 7G library (10 μM each ganglioside). For the solution containing the PLPDs produced at 4 h incubation, ion signal corresponding to free CTB5 and CTB5 bound to one ganglioside (L), i.e., (CTB5 + qL)n− with q = 0–1 and n = 12–14, were detected (Figure 4a). To establish which gangliosides were bound to CTB5, CID was performed on the (CTB5 + qL)n− ions in the Transfer region (75 V). Collisional activation resulted in the appearance of singly deprotonated GM1 ions, as well as CTB monomer ions (Figure 4e). At longer incubation times, signal corresponding to CTB5 bound to two ganglioside ligands was also detected and CID resulted in the appearance GM1, as well as other gangliosides, although with much lower abundances (Figure 4b–d). For the PLPDs produced at 2.5 days incubation, GM3 and GD1 (GD1a and/or GD1b) were detected (Figure 4f); for the PLPDs produced at 5 and 10 days incubation, GM1, GM2, GM3, GD1, and GT1b ligands were detected (Figure 4g, h). No GD2 was detected in any of the measurements. Notably, the results obtained for the PLPDs produced from ≥ 5 days incubation are consistent with those obtained for POPC-PDs prepared directly from the 7G library (Figure S6, Supporting Information) . Analogous measurements were performed using natural libraries of glycolipids extracted from pig and mouse brains. The commercial pig brain extract is known to contain the gangliosides GM1a, GM1b, GM2, GM3, GD1a, GD1b, GD1c, GD2, GD3, GT1a, GT1b, GT1c, GT2, GT3, and GQ1 (structures shown in Figure S1, Supporting Information) . The presence of fucosylated-GM1 (Fuc-GM1, structure shown in Figure S1, Supporting Information) in the extract was also recently reported . An ESI mass spectrum acquired in negative mode for a methanol solution of the pig brain extract is shown in Figure S7 (Supporting Information). Assuming similar ESI-MS response factors, GD1, GT1, GM1, and Fuc-GM1 are the most abundant gangliosides present in the mixture. Other gangliosides, including GM2 and GM3, appear to be at much lower concentrations based on the ESI-MS data. For the mouse brain extract, which was prepared in-house, ESI-MS analysis revealed abundant ions corresponding to glycerophospholipids, as well as GM1, GD1, and GT1 ions (Figure S7, Supporting Information) . Ganglioside identification was based on the measured MWs and CID fragmentation patterns (Figures S8–S11, Supporting Information) . Assuming similar ESI-MS response factors, this analysis suggests that GD1 is the most abundant ganglioside type in the mixture, followed by GM1 and GT1. Shown in Figure S12a (Supporting Information) is a representative ESI mass spectrum acquired for aqueous ammonium acetate solutions (200 mM, pH 6.8, and 25 °C) of CTB5 (3 μM) and the pig brain extract (at an estimated concentration of 80 μM). Under these conditions, only signal corresponding to free CTB5 ions, i.e., CTB5n− at n = 11–15, was detected. ESI mass spectra acquired for aqueous ammonium acetate solutions (200 mM, pH 6.8, 25 °C) of CTB5 (3 μM) and PLPDs (20 μM) produced by incubating for 4 h, 2.5 days, 5 days, and 10 days, at room temperature, with the extract (at an estimated concentration of 80 μM). Analysis of the solution with PLPDs produced after 4 h incubation identified ions corresponding to free CTB5 and CTB5 bound to one ganglioside ligand (Figure 5a). CID of the (CTB5 + L)n− ions in the Transfer region (75 V) produced abundant GM1 and fucosyl-GM1 anions (Figure 5e). These results are consistent with data acquired using pre-loaded POPC-PDs produced from the same lipid extract (Figure S13, Supporting Information) . For the PLPDs produced at longer incubation times (≥ 2.5 days), gaseous ions of CTB5 bound to up to two gangliosides were detected (Figure 5b–d). In addition to GM1 and fucosyl-GM1, deprotonated ions corresponding to GD1 and GT1 were detected (Figure 5f–h). No GD1 or GT1 ions were detected by CaR-ESI-MS performed using pre-loaded PDs produced using this extract (at the same concentration) (Figure S13, Supporting Information). It should also be noted that neither the PLPDs nor the PDs yielded evidence of GM2 or GM3 binding. The absence of binding is attributed to the low concentrations of these (low affinity) gangliosides in the extract. 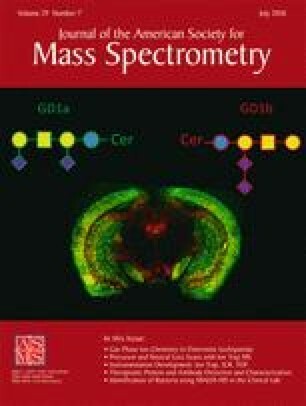 Shown in Figure S12b (Supporting Information) is an illustrative ESI mass spectrum acquired in negative ion mode for aqueous ammonium acetate solutions (200 mM, pH 6.8, 25 °C) of CTB5 (3 μM) with glycolipids extracted from mouse brain (at an estimated concentration of 80 μM). Similar to what was observed for the analysis of the solution of pig brain extract, only free CTB5 ions were detected. Measurements performed on the solution containing the pre-loaded PDs, produced directly from the mouse brain extract, resulted in the detection of ions corresponding to free CTB5 and CTB5 bound to one molecule of GM1 (Figure S13, Supporting Information). In contrast, analysis of the solutions containing PLPDs produced by incubating POPC-PDs with the extract for 5 or 10 days revealed ions corresponding to CTB5 bound up to two ganglioside ligands, which were identified as GM1 and GD1 (Figure 6). The binding of GT1 gangliosides was not detected, presumably due to its low concentration in the extract, vide supra. Taken together, the CTB5 binding results obtained for the pig and mouse extracts revealed notable differences in the performance of PLPDs and conventionally prepared PDs for screening natural libraries of glycolipids against GBPs using the CaR-ESI-MS assay. The use of PLPDs produced using incubation times of ≥ 5 days led to a higher occupancy of the CTB5 binding sites and the identification of more glycolipid ligands than the use of pre-loaded PDs produced directly from the lipid extract. This work describes the use of PLPDs, prepared by incubating phospholipid PDs with glycolipid-containing lipid mixtures in aqueous solution, for CaR-ESI-MS screening of glycolipids against GBPs and compares their performance with conventional, pre-loaded PDs, prepared directly from a mixture of phospholipid and glycolipid(s). Experiments carried out on GM1 glycomicelles revealed evidence of GM1 incorporation into PLPDs within a few hours of incubation and increased with increasing incubation time. At ≥ 10 days, GM1 binding to CTB5 was indistinguishable from that observed with pre-loaded PDs produced directly from GM1 (at the same initial concentration). The transfer of GM1 from glycomicelles to NDs was also observed, although the apparent rate of incorporation is slower than for PDs. Comparison of ganglioside binding to CTB5 measured for pre-loaded PDs and PLPDs prepared from a ganglioside library or glycolipids extracted from pig or mouse brain revealed that PLPDs allow for the detection of a greater number of ganglioside ligands than the pre-loaded PD. However, low abundance, low affinity ligands were not detected with either the PLPDs or PDs. Together, the results of this study suggest PLPDs may have advantages over conventionally prepared PDs for screening glycolipids against GBPs using CaR-ESI-MS. The authors are grateful for the financial support provided by the Alberta Glycomics Centre (J.S.K. ), the Natural Sciences and Engineering Research Council of Canada (G.G.P. ), and an Alberta Technology Futures Graduate Student Scholarship (J.L. ).